Is your pup’s special day coming up soon? 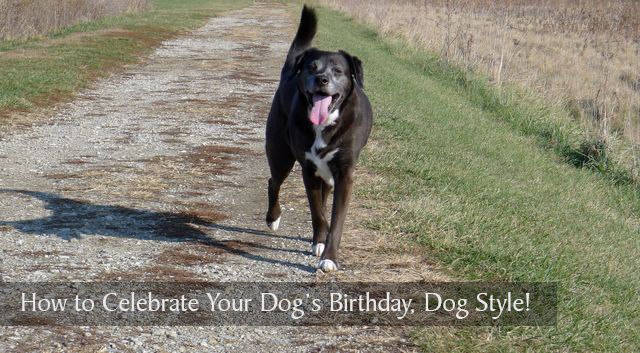 Are you looking for a way to celebrate your dog’s birthday? I’ve never been one for doggy birthday parties with banners, balloons, doggy friends or a dog-healthy homemade cake and I definitely know Haley would not be thrilled about wearing a party hat for twenty minutes while I try to get the perfect photo of her “enjoying” her party. Since Haley’s 8th birthday was last Friday, I decided this year to give her what I knew she would love the most for her birthday. A day filled with a few of her favorite things! 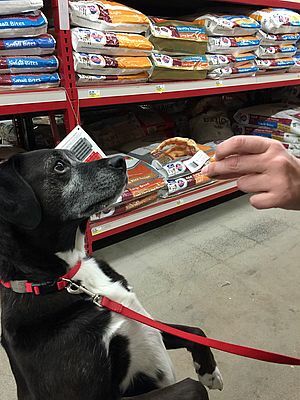 Click the eight birthday ideas below to discover some Haley-approved surprises for your dog’s next birthday. 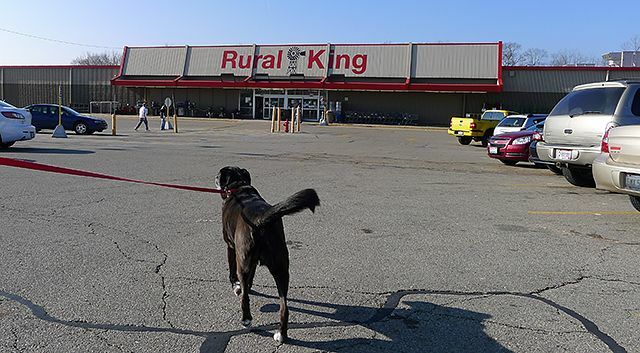 Take your dog to their favorite pet-friendly store. Buy a handful (or should I say foot-full) of her most tasty treats! Yeah, these are a little weird, but it’s Haley’s new favorite snack. 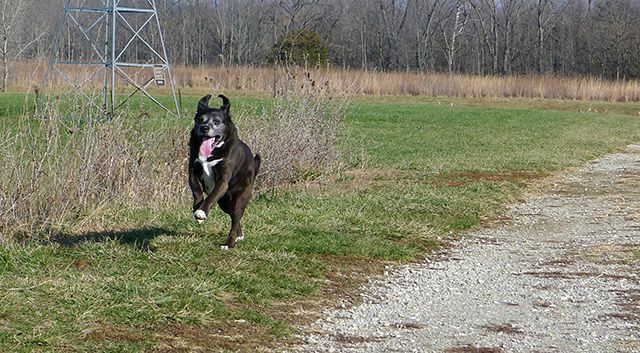 If your pup has good recall, take her for a walk on her favorite off-leash hiking trail or try hiking somewhere new if your dog loves the excitement of a new adventure. What dog doesn’t love chasing after or chewing on a good stick? 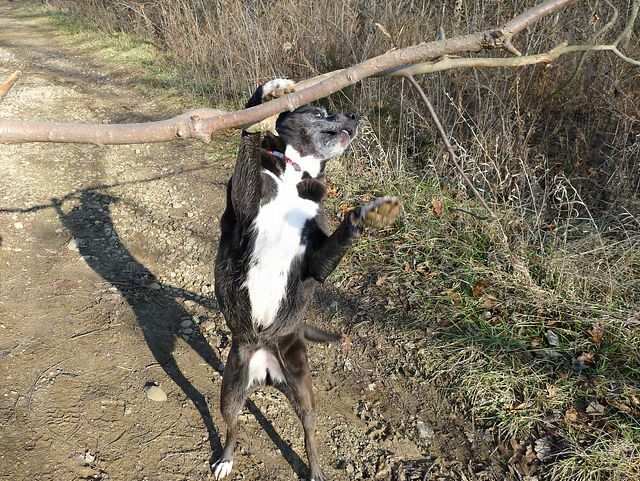 Haley makes it her job to wrangle the biggest sticks she can find. 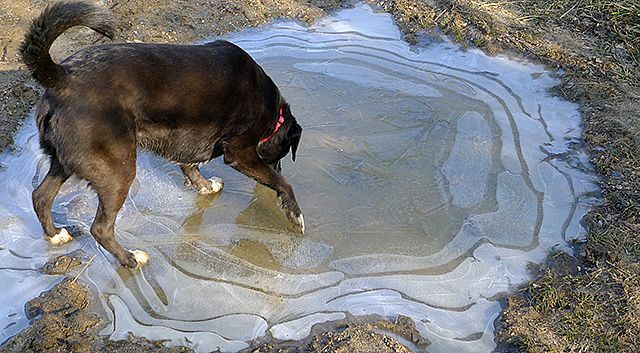 Enjoy nature with your pup, whether it’s skating on frozen mud puddles or just basking in the sunshine. 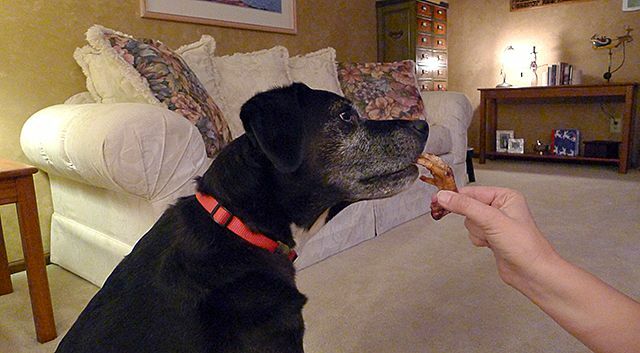 Go ahead, allow your dog to indulge on another of her favorite treats. After all, it is her birthday and that was quite a hike earlier in the day! Chicken foot anyone? 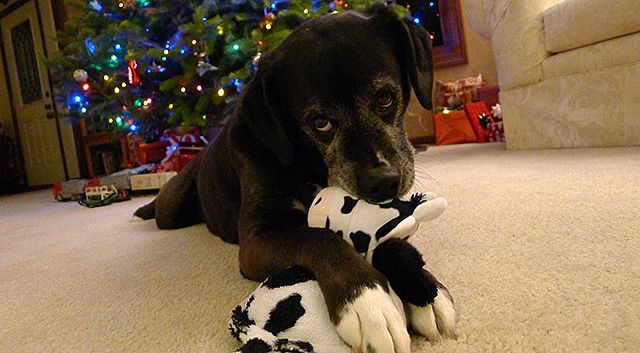 Dogs and people alike, love gifts on their birthday. 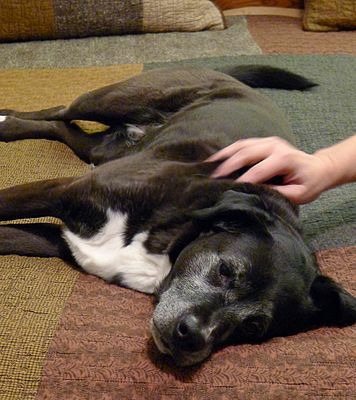 What better way to end the special day than with a relaxing massage or extra long belly rub. Happy Birthday Haley! It felt great to watch Haley enjoy doing all the things she loves and to celebrate her birthday dog-style rather than trying to make her enjoy a human-style birthday party. Some dogs might love the banners, balloons and posing for photos, but Haley enjoyed her special day this year doing her favorite things. Do you celebrate your dog’s birthday? Share your favorite ways to celebrate. What a great list of suggestions. Jack & Maggie would love every one of those! Haley’s favorite is definitely the off-leash hike! Honey turns five next month. So you’ve really got me thinking. Honey gets many of these things every day (except the visits to the pet store; not a great option without a car). But I don’t often give her massages. So maybe that will be her special treat. Along with a big, messy marrow bone. Sounds like a lovely day! I get an extra special feast for my birthday, because I LOVE to eat. And belly rubs! And presents! And more bellyrubs! Thank you Chewy! Haley really enjoyed her birthday surprises this year. What a fabulous list. Happy birthday Haley. It sounds like a wonderful birthday. We do celebrate mini parties with the other dogs and usually it involves a special treat or sometimes it is a hunt (for Freighter since his birthday is during hunting season). I bet Freighter loves celebrating his birthday with a hunt! How cute! I normally don’t do much to acknowledge my pets’ birthdays but just last night I was thinking I’d like to do something special for their 2015 birthdays. They are all getting up there, and I just want to do something special with them. Ace turns 9 on (about) March 1. I think I will be doing most of your suggestions for him! Thanks Lindsay, I look forward to reading about Ace’s 9th birthday in March! It sounds like you made a great day for Haley. Every dog should have days like that. We celebrated Delilah’s 9th birthday on Sunday. We took two nice walks and enjoyed spending time together. So happy to find y’all! Have a holly jolly weekend and a Merry Christmas! Hey Hawk, thanks for coming by to check out the blog. I enjoyed visiting your BrownDog blog today as well! Great tips, we always are looking for stuff to do on our gangs bday. Nice to meet you and Haley. Have a great holiday season. Aw I love those photos of Haley – that was a great birthday for sure. I especially love the face on #4, I mean who doesn’t love to wrangle a big ol’ stick. Thanks Jen! She had a great day and we had a lot of fun watching her really enjoy herself on her special day. I hope Brownie had a fantastic first birthday celebration yesterday! That’s a big milestone, so many changes happen in the first year. I hope he enjoys the dog park membership and gets to meet lots of new puppy pals at the park. Thanks for stopping by, Joy!